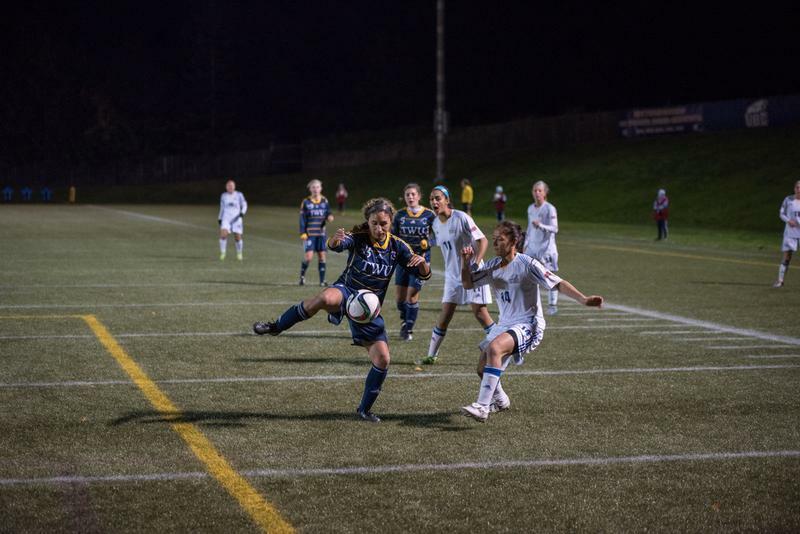 The Thunderbirds women’s soccer team had plenty of reasons to celebrate this week. Not only did they beat the University of Saskatchewan Huskies to earn a place in the the Canada West Final Four, they did so with a well-earned 3-0 win in Saskatoon. The game was hard fought for both the ′Birds and the Huskies as each team recorded seven shots. UBC keeper Marlee Maracle came up big for the ′Birds, putting up three saves throughout the game to complete the shutout — it was a big help for the ′Birds too, as they got off to a slow start in the first half, only getting one shot on goal while allowing the Huskies four. Despite the slow start, the ′Birds still held a 1-0 lead after 45 minutes of play thanks to a corner kick bent into the net from midfielder Rachel Jones. The second half saw the ′Birds take off, scoring just over two minutes in after striker Aman Shergill tipped a pass from defender Jessica Williams past the Huskies keeper. Four minutes later, Williams herself would score her own unassisted goal. In the second, the T-Birds tightened things up, only facing six foul calls and putting six shots in Saskatchewan's direction. Their positive momentum kept them in the game, solidifying a 3-0 win. It's a big result for UBC as they returned to Vancouver with a coveted spot in the Canada West Final Four. They will face the Trinity Western University Spartans on Friday, November 3 in the first game of the tournament in Langley. The University of Victoria Vikes and the MacEwan University Griffins round out the Final Four group for the weekend.